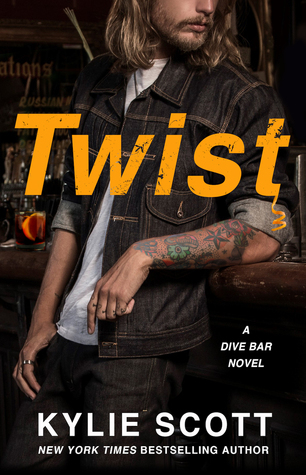 I was in the mood for a light and fun contemporary romance book, and I found that in Twist. I liked the plot and really enjoyed the first half of this book. This book is about Joe Collins, who isn't a SUPER alpha male but he is a very loyal and protective of his family and friends. Alex is someone who doesn't have a lot of friends and mostly keeps to herself, while Joe spends most of his time around people. The first time these two meet in person was pretty awkward. I really felt bad for Alex for being in such a situation. I totally understood her anger and I found Joe's excuses weak. However he did redeem himself by not giving up and trying to get Alex to forgive him. I loved their banter in the first half of the book. However the second part was a bit of a let down for me. After a particular incident their dynamic totally changed, and Joe wasn't my favorite person anymore. I understood a little bit were he came from, but I wish he didn't act the way he did. There was unnecessary drama that didn't fit the story, it felt forced. The last quarter of the book felt rushed and left me unsatisfied. Which resulted in me not being fully committed to the characters and story. I did enjoy the writing and some of the side characters. There is one couple whose story I would really enjoy reading, hopefully they will be up next.